Hex is rated 3.0 out of 5 by 10. Rated 4 out of 5 by LunaNik from Challenging puzzle game with (for me) a couple of issues. I've been a gamer since 1980, and currently own 638 computer games. An immersive storyline and challenging, innovative gameplay are most important to me. —————————— The goal is to clear the tiles from the board by clicking on them in sequence without backing yourself into a corner, so to speak. It's similar to both peg solitaire and fill the grid, but with different game mechanics. Obviously, the levels become progressively more difficult. Overall, it's a well-designed game with spectacular production, but I think a couple of changes would make it more appealing to a wider variety of gamers. 1. A brief tutorial showing which moves are valid and which aren't would have been fantastic. It didn't make sense that I could move diagonally, but not horizontally or vertically when the space between the tiles appeared to be the same. Which leads me to… 2. I found it difficult to discern exactly how much space was between tiles, leading me to assume certain tiles would be available when I reached them. If the spaces were identified, perhaps with a small circle for each space, it would have helped. I only reduced my rating one star because of these issues, because I do think it's a thoughtfully designed game for the most part. So, I recommend you try the demo, since you may not have the same difficulties. Rated 4 out of 5 by elizadee from GOT MY ATTENTION! I just started playing and you have my full attention! I love this type of game and Big Fish should have more. Make the right choices to remove all tiles on each level or "restart" if the wrong choice is made. Just remember which tiles you selected when you got to the point where you had to start over. Challenging and it's a great go-to when I have a little time to fill. TRY IT!! Rated 4 out of 5 by Bobby8353 from Nice! This is a new type of game. Very challenging and relaxing. It reminds me of the frog mini game where you have to decide where the frog should hop from lily pad to lily pad. Now I'm off to play some more of it. Give it a try! 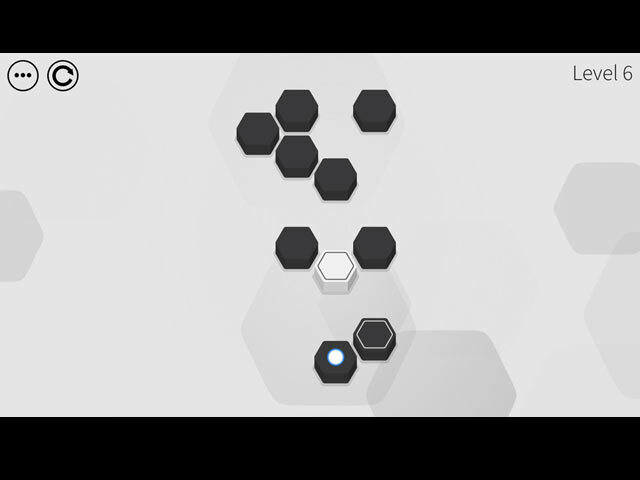 Rated 3 out of 5 by Bunny1419 from Agree with LunaNik on this Really enjoyed this until I reached level 6 and it was near impossible to discern the distance between the hexes. After three resets decided not to buy. Would likely buy if this could be fixed. Rated 3 out of 5 by Jade1953 from Studio Goya This was a puzzle / strategy game; however, I was frustrated by it. The play was self-explanatory, but, the same thing over and over. There was no "storyline". Make up your own mind about this one :). Rated 2 out of 5 by Tflo from Just overall Boring... The game itself, in black, white and gray, is very bland. Hopping one way and then backtracking again is tedious and boring. How different can each attempt be? Not much. There is absolutely nothing to keep you interested...Yawn. Rated 2 out of 5 by CyndiLouWho2 from Simply boring game Yes, it's another of those simple basic games originally designed for tablets or phones. And yes, I won't be paying for this one either. Seeing the high five star ratings is totally baffling to me. 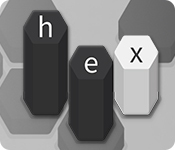 Hex looks boring with it's lack of color and flat graphics. And game play get boring due to a lack of variation. The game reminds me of the old peg jumping games where you have to end up with only one peg remaining. The first few levels of Hex are okay, but after that I lost interest. This really should be one of those free-to-play games in my opinion. Rated 2 out of 5 by BSHADOW from Not my cup of tea I thought this was going to be a word game but it's not. You just jump from tile to tile to make them disappear. It's kind of like the peg games where you jump around and take the pegs away. I found it boring and annoying. Some might find it fun but it's not for me.